Barlowe's Herbal Elixirs is proud to offer a customized herbal blend (Liver Support Formula) which has been formulated to help cleanse and strengthen the liver. It contains half 80% Silymarin Milk Thistle and half 20% Taraxasterol Dandelion Root Extracts. Bottled in Glass! No Stearates! No Fillers! No Junk! Now 650mg! 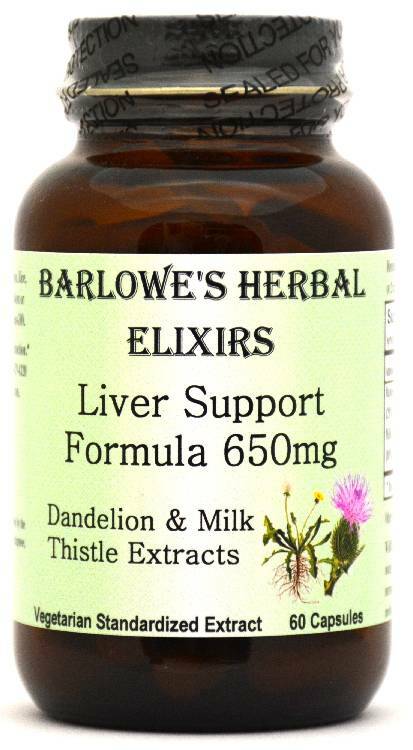 Barlowe's Herbal Elixirs is proud to offer a customized herbal blend (Liver Support Formula) which has been formulated to help cleanse and strengthen the liver. It contains half 80% Silymarin Milk Thistle and half 20% Taraxasterol Dandelion Root Extracts. Bottled in Glass! No Stearates! No Fillers! No Junk! Liver Support Formula contains two potent and very highly concentrated herbal extracts which are reknowned for cleansing and nourishing the liver. The first, Dandelion Root (Taraxacum Officinale), has been utilized for centuries to combat liver and gallbladder problems, and to remove poisons from the blood. It also stimulates the kidneys to enable rapid removal of toxins. The genus name "Taraxacum" is derived from the Greek words "taraxos" meaning "disorder" and "akos" meaning "remedy". In this formula, Barlowe's Herbal Elixirs uses a high priced, very powerful Dandelion Root Extract which has been standardized to a minimum of 20% Taraxasterols - the most biologically active ingredients in the root. 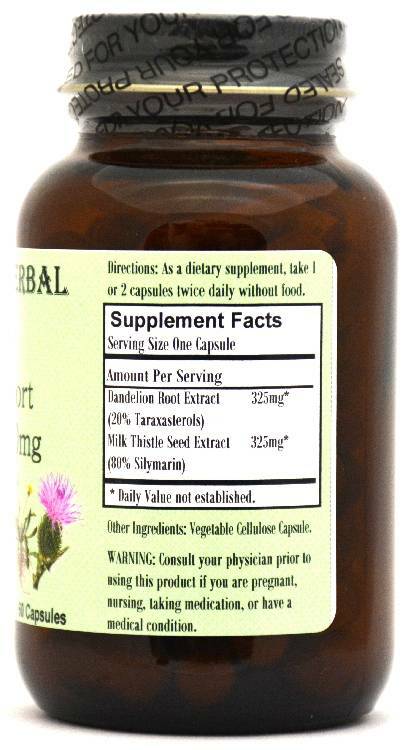 The second herbal remedy found in Liver Support Formula is Milk Thistle (Silybum Marianum) Extract. The extract used has been standardized to a minimum of 80% Silymarin and is the most potent Milk Thistle available. Milk Thistle has been utilized since Greco-Roman times as an herbal remedy for a variety of ailments, but particularly for liver problems. In the late 19th and early 20th centuries, physicians widely used Milk Thistle to relieve congestion of the liver, spleen and kidneys. Today, several scientific studies suggest that Silymarin, the active ingredient in Milk Thistle, protects the liver from damage caused by alcohol, toxins and certain drugs such as acetaminophen. Caution: Barlowe's Liver Support Formula is generally safe, but it is potent and should be utilized with care. This product is for dietary use. If side-effects occur, discontinue use immediately! The above statements have not been evaluated by the Food and Drug Administration (FDA). This product is not intended to diagnose, treat, cure, or prevent any disease. Directions For Use: Take one capsule either twice or three times a day without food. Results and usage amounts may vary based on body type and weight.